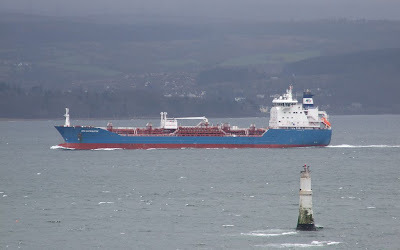 Another of the Brostrom 'D' class tankers, BRO DISTRIBUTOR, was seen passing the Gantock beacon this afternoon as she made her way to Finnart to load refined product from Grangemouth. Like her sisters, she was built at the Jinling Shipyard at Nanjing in China. Joining her owner's fleet in September 2006, she is 146.7 metres overall, with a deadweight of 14,907 tonnes. Third of a class of four ships, BRO DISTRIBUTOR is manned by a entirely Swedish crew.